The United States Mint is the most active mint in the world, producing billions of circulating coins, tens of millions of bullion coins, and millions of numismatic or collector coins every single year. CoinNews.net publishes at least one weekly numismatic report of current US Mint Coin Sales Figures, as provided by the US Mint directly. These coin sales figures are indispensable to both coin collectors and investors for determining current demand, coin mintages, and more. For a daily update on bullion gold and silver coin sales, jump to latest bullion coin news section of this site. Bags and rolls of Guam quarters went on sale May 26 and in less than a week their numbers outshined the first weekly performance of the Puerto Rico quarters. And that happened prior to collectors learning of the extremely low Guam quarter mintage. Instead of rehashing the same details here again, read the CoinNews article entitled Guam Quarter Mintage & Sales Figures. Sales of new Lincoln penny rolls continue to slow, yet an additional 14,539 of the two-roll sets were purchased just last week. An amazing 23.7M Rail Splitter Cents were sold from May 14 to May 31. Braille Silver Dollar demand wilted following an impressive rise in the prior week. The latest US Mint numbers show 2,823 more were acquired for a new total of 168,564 across the proof and uncirculated options. Lincoln Rail Splitter cents are still in demand, Braille Silver Dollar sales surge, Puerto Rico quarters are expired and UHR $20 gold coins continue mostly at their regular pace. Repeating what most coin collectors already know, the Lincoln Rail Splitter cent went on sale Thursday, May 14. By Sunday, 200,055 of the two-roll sets were sold, equating to more than 20 million pennies. Flash forward more than a week to the lastest US Mint sales data… 22,771 more sets have sold for a total of 222,826. For background, read the CoinNews article from earlier this week entitled Lincoln Rail Splitter Sales “Normalizing”. Two Braille Silver Dollars returned from their flight aboard space shuttle Atlantis on Sunday. During their orbital trip, sales of the coins experienced their own mini launch here on earth –although not to the 50,000 level the NFB wanted from the public. Still, 10,000 more Braille dollars were sold, which pushed the gas pedal down some. The proof jumped the most, rising a healthy 8.0 percent over the prior numbers. To date, 165,741 of the allotted 400,000 silver coins have been sold. Lincoln Formative Year cents are on fire, UHR $20 gold coins are selling at a level pace, demand for Braille Bicentennial Dollars has picked up slightly, and Puerto Rico quarter sales are mixed. Although the public is happier with improved access to the new pennies, collectors are generally disappointed as US Mint sales continue with no apparent end in sight, making the cents far from "scarce." 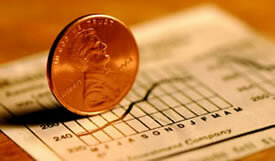 In the Log Cabin penny launch, the Mint concluded sales after 96,000 of the two-roll sets were sold. Then, more than one collector was taken aback by the unexpected stoppage. With this series, the Mint is in an apparent no-win situation. Coin collectors have shifted into a lower buying gear during the last several days. While US Mint sales of UHR $20 gold pieces inched, or more aptly millimetered higher, demand fell for Braille Bicentennial Dollars and Puerto Rico quarters. Ultra High Relief (UHR) $20 gold coins had just come in 27 short of 61,000 in the previous report. That number has been breached, plus 757 more. Sales increased 1.3 percent compared to the prior 1.0 percent rise. As a side note, the Mint increased the UHR price Wednesday by $50 and that is likely to play into next week’s sales figures to some degree. For the second straight time, Braille Bicentennial Dollar sales have declined. However, the newest batch of numbers is down substantially while those from last week remained impressive for a collection of coins that have been on sale since March 26. The tables below shows the tale, but suffice it to say, total new sales were down by more than 75 percent to just 4,617 compared the prior 20,306. Braille Silver Dollars are selling robustly, UHR $20 gold pieces near a new level, and Puerto Rico 100-coin quarter bags pass 30,000, according to the latest US Mint sales report. While sales of Braille Silver Dollars slipped compared to previous week’s figures that were simply out of this world crazy, collectors are still buying the coins at a remarkable pace. 20,306 more have been sold, bringing the grand total up to 145,308. At the current rate, nearly 3,000 are snatched up every single day. Ultra High Relief (UHR) $20 gold coins break a new threshold and Braille Commemorative Silver Dollar sales soar, according to the latest US Mint sales report. Ultra High Relief (UHR) $20 gold coin sales cooled off compared to the last figures, but rose above the magic 60,000 barrier. With an average price of around $1200 each, the total is quite impressive. In a surprise for the second straight week, sales of Louis Braille Silver Dollars shot up… really shot up. Proofs jumped by 38.1 percent over the prior numbers, with 21,636 additional sold. The uncirculated options rose by nearly 30 percent, with 10,200 more purchased by collectors. Ultra High Relief (UHR) $20 gold coin sales were near identical to those reported last week, based on the latest round of US Mint sales figures. Another 1,300 have been sold, bringing the new total to 58,318. In a surprise, Louis Braille Silver Dollars broke a declining trend that had become the norm over the last several weeks. While sales increases were held to around 12% in the prior week, proof Braille’s jumped to 20 percent. The uncirculated options climbed to 16 percent. In total, 93,166 Braille commemorative silver coins have been sold. For the third consecutive week, Lincoln Silver Dollars and Lincoln Birthplace cent rolls figures have remained unchanged. Each reached sellouts weeks ago. Lincoln Silver Dollars and Lincoln Birthplace cent rolls look to have settled into their final figures, according to the latest sales report from the United States Mint. The numbers have remained constant for two consecutive weeks. The proof Lincoln silver dollar officially sold out Tuesday morning, although new orders had been on a "waiting list" since March 27 — meaning the Mint would process a new order only if an old one prior to the 27th was cancelled. Ultra High Relief (UHR) $20 gold coins picked up slightly, with 1,300 sold compared to the prior week’s reported 491. Likely helping somewhat was the Mint $50 price reduction on April 8. The latest US Mint sales figures has data shifting not only up, but down. Lincoln $1s and Birthplace penny roll totals were clipped lower. Braille Silver Dollars improved nicely, and the pace of Ultra High Relief (UHR) Gold coin slowed even more. A magical correction has appeared for the Lincoln Silver Dollars. Whether it was customer returns, cancellations or Mint accounting tweaks, the proof and uncirculated sales figures are now aligned with the stars. Combined sales dropped by 15,614. A perfect 325,000 sold is listed for the proof and an all-natural 125,000 for the uncirculated option. And with those numbers, 50,000 are left for the special 5-coin proof set the Mint will release later this year. Last week the numbers were twisted in what appeared to be an apparent oversell of coins, leaving less than 35,000 coins free for the special set. Articles to the left and directly linked below are based on US Mint collector coin sales data delivered each week to CoinNews.net. 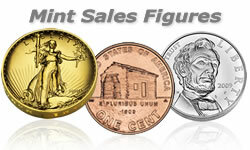 Public US Mint investment-grade bullion coin sales figures released daily is also used.